If a single date could be identified as the historical break with traditional Christian and Jewish pro-life values if one desired to highlight the West’s very first step down the slippery slope it would be August 14, 1930. However, the very critical first crack in the wall happened at the Anglican Bishop’s Lambeth Conference of 1930. Just as the ‘hard cases’ were used to obtain abortion on demand and just as they are now being used to lobby for euthanasia on demand they were used sixty years ago to get artificial birth control. The historic Anglican Bishop’s Resolution 15 of August 15, 1930, passed by a vote of 193 to 67, reads as follows. Those who examine this statement carefully will clearly recognize the familiar semantic tools of the pro-abortion movement. Notice that Resolution 15 sounds smooth, firm, and compassionate. Notice also that it places no real limits on the Christian, but instead leaves any action at all up to him and his conscience. Notice that the allowable ‘methods’ are not defined by Resolution 15. Notice also that the term ‘Christian principles’ is not defined. Using the statement above, abortion and even infanticide could easily be justified if the “conscientious” individual thought that the child would be a burden or an inconvenience in any way. The reaction of many people to the above statements by the Anglican Church and the Federal Council of Churches was immediate and forceful. In the early 1930s, priests and ministers from the Catholic Church and other denominations were not afraid of being labeled “judgmental,” “backward,” “bigoted,” “narrow-minded,” or “out of touch with mainstream American society.” Half a century ago, the churches had not given up their right to be a forceful voice in the public square, and were not intimidated by atheist groups into silence. 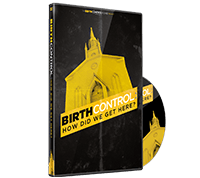 These churches predicted that easy access to artificial birth control would lead to abortion and the destruction of the family. It is fascinating to read these 60-year old statements by major Christian churches and the secular press, and to realize how precisely current events have fulfilled their prophecies. The writers, all experienced students of human nature, understood the ‘slippery slope’ concept, and also clearly recognized that we had taken the irrevocable first fatal step. The pro-contraception stand by the Federal Council of Churches was condemned by virtually all major churches, as shown in Figure 98-1. The whole disgusting [birth control] movement rests on the assumption of man’s sameness with the brutes … Its [the Federal Council of Churches] deliverance on the matter of birth control has no authorization from any churches representing it, and what it has said I regard as most unfortunate, not to use any stronger words. It certainly does not represent the Methodist Church, and I doubt if it represents any other Protestant Church in what it has said on this subject. Carried to its logical conclusion, the committee’s report, if carried into effect, would sound the death-knell of marriage as a holy institution by establishing degrading practices which would encourage indiscriminate immorality. The suggestion that the use of legalized contraceptives would be “careful and restrained” is preposterous. Excerpt from Chapter 98 of the Pro-Life Activist’s Encyclopedia published by the American Life League.